A lonely house, in the middle of nowhere, surrounded by barren grassland. Its inhabitant is Iso Ian. 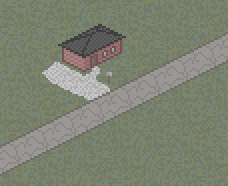 It's a very small house, with a stone pebble driveway. The road this tiny house sits on is poor, with cracks and only one lane. Let's see how this place grows.